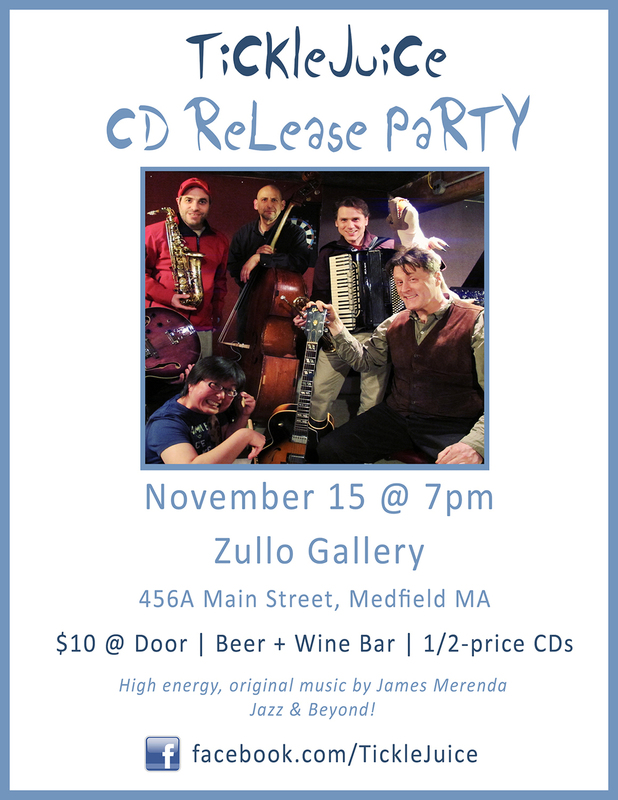 Come join TickleJuice for the ‘Roots To The Stars’ CD Release party at Zullo Gallery Center for The Arts in Medfield, MA this Saturday, 11/15 @ 7pm! Come hear high-energy, original music - jazz and beyond! This night only, CDs will be half price. Led by multi-instrumentalist and composer James Merenda, the band includes Tom Duprey on cornet, David Hawthorne on guitar, Vanessa Morris on piano, Jon Dreyer on bass, and Miki Matsuki on drums. Also - collaborator and our web designer Geena Matuson may project a music video created for TickleJuice during the show! Check out the poster for more information! Poster designed by Geena Matuson.